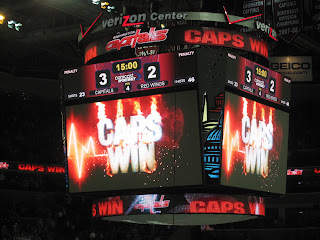 TheWirk.com ~ voted BallHyped.com's 2010 "Best Independent Sports Blog": Caps beat the Red Wings, 3-2 ~ Happy Tuesday! Caps beat the Red Wings, 3-2 ~ Happy Tuesday! The Donkey typed that that the Red Wings were in town and that the Caps were on a winning streak. Hmm, it sounded like a big game and it'd been a month or so since I'd been to a Caps game and I decided I wanted to go. The Donk shares season tickets with a buddy of his, and he didn't have seats to tonight's game. I asked him what he'd be willing to pay and he set his price at $60/ticket. I was already on the Caps ticket exchange, and I didn't see anything available in that price range. The Donk replied that I needed to check Craig's list. There are many things I'd rather do than check Craig's list. Don't believe me? Believe this.... I'd rather (1) get my teeth cleaned, (2) try to move my 200 pound Sony TV fossil from one room to another, (3) go to the post office, (4) wait in line at the bank, and (5) pick someone up at the airport ~ ALL in one day than deal with someone on Craig's list. Craig's list bothers me because I have no idea whether the person I'm dealing with is selling a legitimate product, whether they'll keep to the deal we agree upon, and follow through on delivery (i.e. which usually means I have to meet a stranger who already knows I have cash on me). To me, it sounds like a recipe for DISASTER. It was already close to 4PM, but I could tell that I semi-motivated the Donkey to look for tickets. He ended up making an offer to someone on Craig's list. The Donk is brave enough to trust and risk death for his Caps. I'm not. I'm from Ohio and we didn't have hockey where I grew up. I recently became interested when I moved to DC and noticed 2 or 3 years ago that the Caps were fun to watch. Since then, I've been to a bunch of games and I've enjoyed them every time. 4PM hit and I had a conference call for work. I was on the call and as time slipped away I noticed that it was almost 5PM and I had never heard back from the Donkey. I assumed he left work since his green light was no longer on for his gchat window. Oh well. I assumed Caps hockey was a "no go" for tonight. Sure enough, I looked at my personal phone and it was being blown up by my friend, Amy. Interesting. Amy never calls me. She's like most of my friends. She's a texter. I picked up and told her that I was on a conference call, but that I'll call her back when it was over. She told me that that wouldn't work, because she needed to know right away if I wanted to go to the hockey game tonight. Say what!?!?! It turns out, Amy's co-worker, Shannon, couldn't go and that Amy had 2 free tickets to a suite for the game. Um, YES, I wanted to go to the game. I told Amy that we're on, but that I needed to track down the Donkey and make sure he wasn't going to end up screwed with 2 tickets. I called him and got voicemail. I texted him and it took a minute. He replied that he's going to the gym. I texted him to make sure we weren't doing hockey together, and then it looked like he changed his mind and wanted to go to the game... Ruh roh... Another text, goes out and I let him know I have a free ticket. "Just go" was the last text he sent me. WOOHOO!!! I was all clear to go see a hockey game with Amy. I headed over to Amy's, since she was driving us to the game. I told her, "Thank you for inviting me". She told me that it's an easy choice because there aren't that many people that are home, that she can get a hold of, who aren't married/have kids, and would want to go. She's right! That's ME. I'm fluid. We headed to the arena and joined the people in the suite. This was Amy's first hockey game either this year or ever. I'm not really sure what she said. 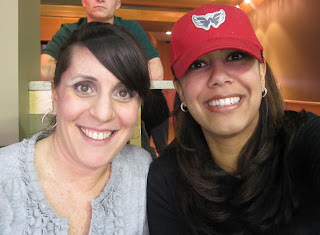 She was impressed that the Verizon Center was so packed on a Tuesday night. Yeah - that's Caps hockey. The team really draws!!!! The Red Wings score first. Booooo! No one throws octopi on the ice ~ we're in DC, people!!! During the game Amy pointed out someone in an astronaut costume. The guy in the astronuat costume is sitting next to a lady dressed up like "I Dream of Genie/Jeanie (sp?)". She's holding a "I dream of Stanley" sign. Clever. Anyway, Amy informed me that supposedly this guy is nicknamed the Capstronaut. Novel idea, considering I just saw Chewbaca in a Vikings jerey at Sunday's football game. Needless to say, I think it's great when people do fun things like that! 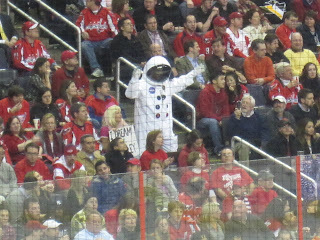 Evidently the Capstronaut gets invited to sit in the owner's box sometimes. Damnit.. That's brilliant! !